In addition to conventional and veneer plaster, Avalanche Plastering does decorative treatments such as crown moldings, rails, lintels, and wall and ceiling details. 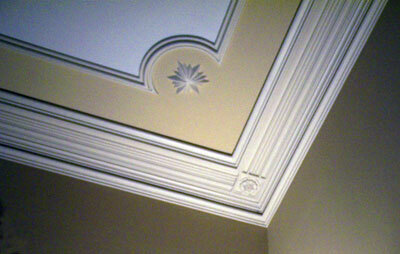 We can repair, replace or install new ornamental and architectural plaster. Features that are straight runs may be run in place, or made offsite on a stone bench. First, we hand tool steel knives that match the existing molding profile. After building a device that the steel knife is affixed to, we run the fixture over wet molding plaster as it is setting, creating new molding sections. If the feature is made in the shop, we cut inside and outside miter joints onsite, and then install the pieces with fasteners and Durabond™. Moldings run in place require us to hand tool the miter joints, which is very labor intensive, so when possible, we create the moldings in 5 foot sections on the bench. 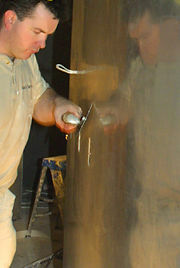 Moldings that have details such as flower petals or egg and darts need to be cast from molds.